Are You a “Gun Free Zone”? While it’s one thing for it to be a federal offense for carrying a firearm into a “gun free zone”, it’s a completely different situation for you to impose such a state upon yourself. There are dire consequences in doing so. And yet the MAJORITY of the women that I speak with who have a concealed firearm permit do not carry a firearm on their person, or even in their purse. As such they are sentencing themselves to the same exposure that a “gun free zone” does to citizens involved in public shootings. While carrying a firearm indeed needs to be a confident proactive decision, too many avoid carrying their firearm on their person for reasons lacking in rationale and substance. Let’s ask this question. If you were a criminal intent on shooting people, or robbing a place with a firearm, where would you NOT want to go? What would be the most stupid place or area you could attempt to hold up? Let’s see… The Pentagon. A police station. A military base. A Texas rodeo. A donut shop in New York (because that’s where a lot of police hang out – j/k) or a pawn shop in Utah—way too many guns there and people with guns. Yup. I haven’t heard of any criminals trying to hold up the Federal Reserve or Fort Knox in a hundred years. I wonder why that is? Oh yeah, there might actually be GUNS there and people who know how to use them. Indeed, with the exception of a little tongue in cheek humor, these places would be the most risky for a criminal to infiltrate as a result of the harm that he would most assuredly face. And since such criminals are cowards of prey, not predators, they would not be inclined to expose themselves to such a risk. Now, let’s ask this question. If you were a criminal intent on killing people, where would you go to avoid the majority of risk with the most possible damage? The post office? A school? A church gathering? Blockbusters or McDonalds? (Both opposed to their customers being armed with the ability to protect themselves). And exactly why is that? Because a criminal knows that there are no lawful firearms in these places. Instead, while there may be concealed firearm permit holders, such holders are statistically very law abiding individuals. So, no guns. Just law abiding citizens. As a result of this rationale, what have we seen parading on our televisions as of late? Shootings taking place in “gun free zones.” In fact, the whole nation watched the consequences of a U.S. ship which was barred from having any lawful guns on it. (Thank goodness the captain and pirates were actually off of that ship when the pirates were shot, otherwise an explosion or something dangerous could have occurred—*sarcasm intended*) Seriously. 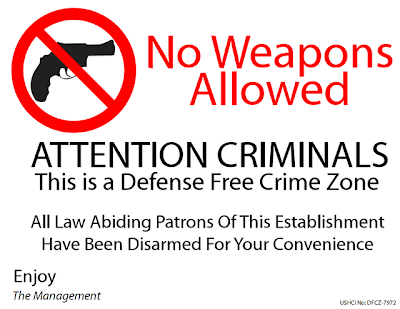 Think for a moment of the multiple victim shootings in “gun free zones” you’ve been exposed to lately. Oakland, CA—No firearm permits issued without insurmountable exceptions. 4 police officers dead at the hands of one gunman. Detroit, Michigan—Michigan College—gun free zone. 2 dead at the hands of one gunman. Blacksburg, VA—Virginia Tech—gun free zone. 33 dead at the hands on one gunman. Colorado Springs, CO—New Life Church—a gun free zone, with the exception of armed security officers who are screened members of the church, one of which stopped the killer with her own gun. 3 were killed that day by a man who was armed with 2 firearms and over a thousand rounds of ammunition. As “STUPID” as criminals are, do you think that they are not aware of the fact that the likelihood of a WOMAN being armed and able to defend herself is less than 1%?? That’s right. They instinctively see women as a perpetually open season “gun free zone.” No wonder they see women as targets, as easily accessible as a church, school, or federal building. Is that really acceptable to you? And besides, in the name of fashion, for crying out loud… Does a big fat neon bull’s-eye on your back compliment any of the fashionable accessories and clothing you adorn yourself with everyday? Contrary to a popular movie title, “death” does not look good on anyone. Now, here’s a compelling 3-minute video to make you think a little deeper about this issue. My point? So-called “Gun Free Zones” don’t do much to protect anyone from criminals. So why would you insist on imposing a “gun free zone” in the sanctity of your own home or in and around yourself? How about doing more with that concealed firearm permit than just having it in your wallet? How about getting the training and confidence that you need to actually start carrying a firearm on your person and being ready for any possibility in which you would need to defend yourself, your family, or members of your community? wow. i don’t think i realized the percentage of women who CAN carry but don’t. if i could (and i can’t, since Maryland is full of crap on this issue…) i’d be armed as often as possible. i can’t imagine having the permit and not using it. Living in Maryland does not preclude you from obtaining a concealed firearm for other states so that when/if you are traveling there you are “covered.” Keep that in mind. My husband and I regularly train folks from all over the U.S. and as such provide them with a UT Concealed Firearm Permit too. If I were you, I’d be sure to obtain a FL one given where you’re located. Shamelessly filched, swiped, stolen and placed linked on my blogs!!! Before the feds come KNOCKIN!! Let’s see… pro-choice, devout Christian, fiercely against illegal immigration, opposed to the current level of government, opposed to the current administration, pro-gun… I think I’m sufficiently qualified for the “terrorist” list of DHS. I live in Vermont. Hopefully I never have to apply to the Government for a permit to practice my second amendment rights….